10.03.2017 - GROUP 1 PREVIEW: The four quarter-finalists from Group 1 are set. Three of them still have something to play for this weekend as their final position in the group has yet to be determined. 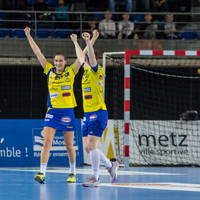 05.03.2017 - GROUP 1 REVIEW: A fantastic victory against HC Vardar helped Metz Handball to secure their spot in the EHF Champions League quarter-final.